Ancient Egyptian mathematics have remained remarkably uniform throughout time and were essentially built around addition. 5000 years ago Ancient Egyptians called their science: Hsb (cf. Old & Modern Arabic hisab)! Amazingly the term Hisab has survived in our Arabic language to this date. The Ancient Egyptians very early evolved a Calendar based on a year of 365 days. When this happened, and the precise way in which it was arrived at is not known, but observation of several astronomical phenomena or the rising of the Nile over a period of time would have been sufficient for its calculation. Intense observation of the heavens was already carried on in predynastic times, and by the founding of the First Dynasty the Egyptians had already constructed a practicable calendar. The invention of the calendar has been hailed as the greatest scientific achievement of the Egyptians and the precursor of the science of mathematics. For reasons which may have been closely connected with the provisioning of officials and the rudimentary system of collecting taxes, the new state bureaucracy soon felt the need for a dating system which distinguished between different years so that they could be recorded. The numbering of years starting from a fixed point was not known, and so each year was described, or named, by one or more of its outstanding events. All of these requirements gave rise to the development of "Hsb" the exact science of mathemathics. 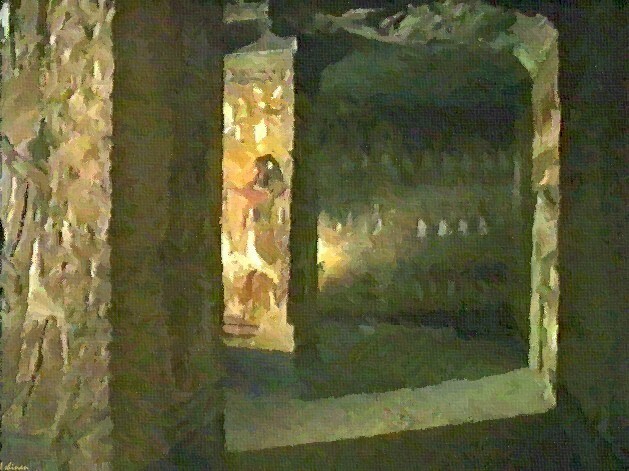 As a result of advancements in the science of Hisb; the burial chamber structure along some of the magazines for tomb provisions were soon dug in the gravel and rock substratum with astonishing precision, which during the Second Dynasty became a veritable maze of underground corridors and rooms. "Hsb" (Ancient Egyptian Mathemathics) advances made at this time had a direct bearing on the lives of ordinary Egyptians as they helped the creation of the unified Egyptian state which soon introduced a new ideological framework and a new political organization of the country. Centralized government based on a powerful bureaucracy (known as per hesb-t literally the house of counting) skilled in the science of mathemathics "Hsb" brought a degree of safety and political stability, and the greater resources of the country under control provided better security against the consequences of natural disasters such as famine, but the greatest effect of the change was in the sphere of Art and Architecture all of which required the intimate knowledge of mathemathics. Art and Architecture, inasmuch as the distinction between them was in Egypt always rather tenuous, now came to the fore. Architecture which benefited from the use of "Hsb"; mathemathics made tremendous progress. The largest customer was the state itself, personified by the king and his immediate family, and many items of everyday life were now also made for the growing numbers of officials. Craftsmen and artists had easier access to raw materials, and were able to specialize as a result of the larger market for their products. When need arose, the state could mobilize a manpower which, in both number and quality, had been undreamt of by local chiefs of the Predynastic Period. 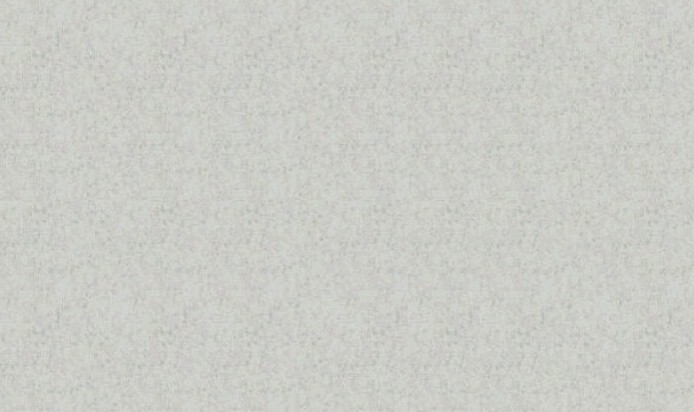 At the beginning of the First Dynasty, a new administrative capital was founded and became known as Ineb-hedj, ' White Wall', presumably because of its appearance. A series of large tombs of high officials and some other members of the royal family were built in the cemeteries in this area, particularly at Saqqarah. Egyptian monumental relief could only develop significantly when the changes in state ideology and religion, and the growing familiarity with mathemathics "Hsb" along the use of stone, found their expression in monumental building. As yet the opportunities offered were few, and until the situation changed in the Third and Fourth Dynasties, the ability displayed at the end of the Predynastic Period could not manifest itself more fully. Our knowledge of official civil architecture, such as palaces, is almost entirely second-hand, based on their representations or presumed similarities in tomb architecture. The same is true of early temples, but we are well informed about tombs. Graves of ordinary people of the earliest period of Egyptian history were not richer or larger than their Predynastic counterparts, but tombs built during the First Dynasty for kings, close members of the royal family, and the highest officials of the state, now increased enormously in size. 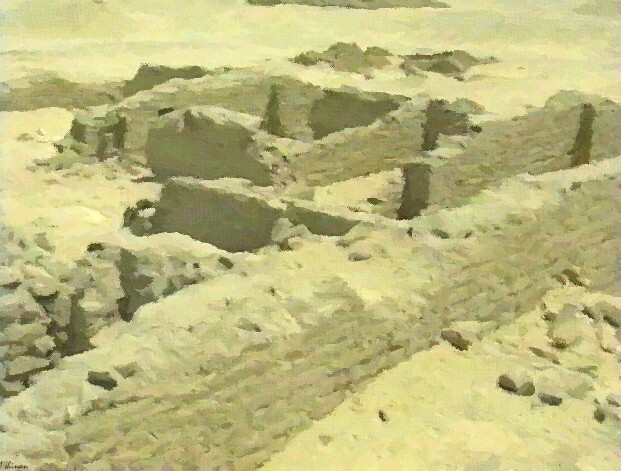 The area of their superstructure was regularly in excess of a thousand square metres (10,000 square feet), and although working with unbaked mud-brick, Egyptian architects and work supervisors were steadly acquiring their knowledge along the managerial skills needed in large-scale monumental building of the Old Kingdom. As a result the burial chamber and some of the magazines for tomb provisions were soon dug in the gravel and rock substratum with astonishing precision, and during the Second Dynasty became a veritable maze of underground corridors and rooms. Between 2700 and 2200 Bc royal tombs were surrounded by a complex of temples and smaller tombs called mastabahs. The burial chamber of the king was protected by a manmade mountain of stone called a pyramid. Its four triangular sides spreading below a single peak represented the rays of the sun shining down over the pharaoh, linking him directly and for all time to Ra. A temple containing a false door through which the ka traveled was built against the east side of the pyramid. All burial grounds were located on the west bank of the Nile since it was in the west that the sun set, beginning its nightly journey into the other world - the same journey that the ka had to make. Plans were drawn up, several thousand men, including stonecutters, masons, surveyors, mortar makers, carpenters, and general laborers were brought to the area. They would work all year long either in the quarries or on the site. Barracks and workshops were built at both locations. A larger work force of over fifty thousand men, most of them farmers, was also drafted every year between July and November when the fields were flooded and farming was impossible. They were organized into gangs to transport stone from the quarries to the site. Each gang consisted of twenty-five men, including a soldier who was the foreman. All the men were paid in food and clothing. Before the building process could begin, the location of true north had to be determined, so that the pyramid could be accurately oriented. A circular wall was built approximately in the center of the site. It was built high enough to block a view of the surrounding hills and the top was made level. This created a perfect horizon line. In the evening a priest stood in the center of the circle and watched for the appearance of a star in the east. Its position was marked as it rose above the wall and a line was drawn from that point on the wall to the center of the circle. He watched the star as it moved in an arc through the sky and finally set in the west. As it dropped behind the wall its position was marked again and another line was drawn to the center of the circle. Because stars appear to rotate around the north pole, the priests knew that a third line drawn from the center of the circle through the center of the space between the first two lines would point directly north. Hsb was also used in surveying as a term for a measure of land equaling 2500 square cubits. 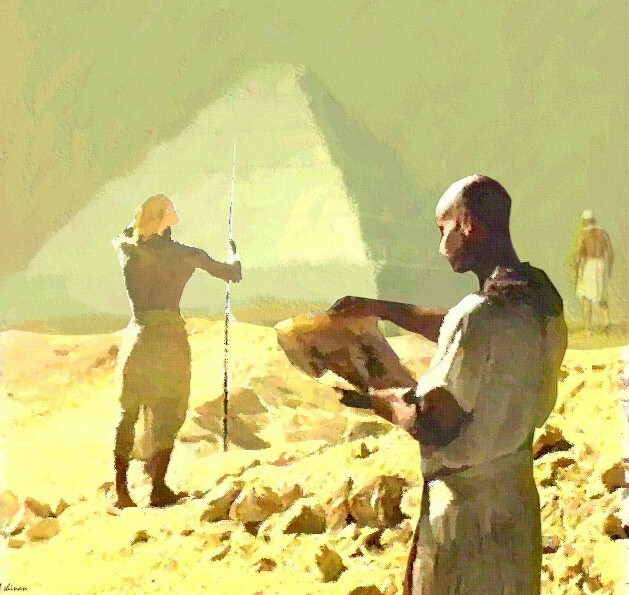 The pyramids serve as a tribute to those who so skillfully organized the efforts of thousands of people using the science of hsb in an attempt to deny the finality of death and the limitations of time by leaving behind something that would last forever. "Hsb" the Ancient Egyptian Mathematics, like the writing of hieroglyphs, were given over more to practical than theoretical considerations. However, our knowledge of all Egyptian sciences is restricted by the fact that the basic formulae were closely guarded by their priestly practitioners and never committed to papyrus. Teaching in Egyptian schools for scribes was for the most part oral, and it is certain that Egyptian mathematics were more extensive than surviving documents suggest. 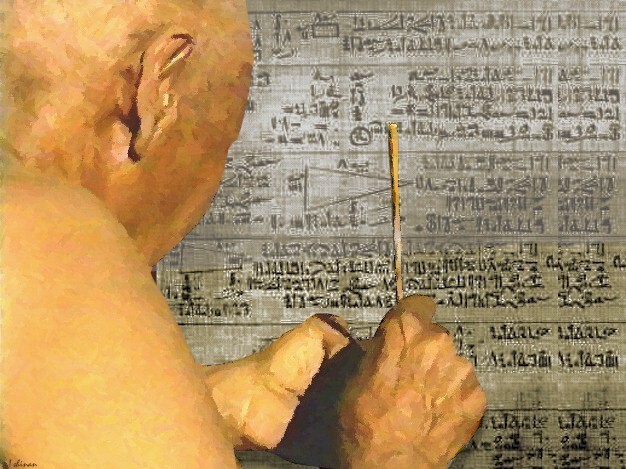 Like so much else in Egyptian intellectual life, mathematics were probably perfected by the Pyramid Age. The decimal system of numeration, employing separate digits and multiples of a hundred up to a million, was in existence as early as the First Dynasty. The device of zero was not discovered, and even the Greeks themselves did not hit upon it. Complex fractions were easily manipulated, with the disadvantage that the only fractional numerator was I. Thus 3/8 was expressed as 1/8 1/8 1/8. Two-thirds, however, appears to have been a fundamental concept. 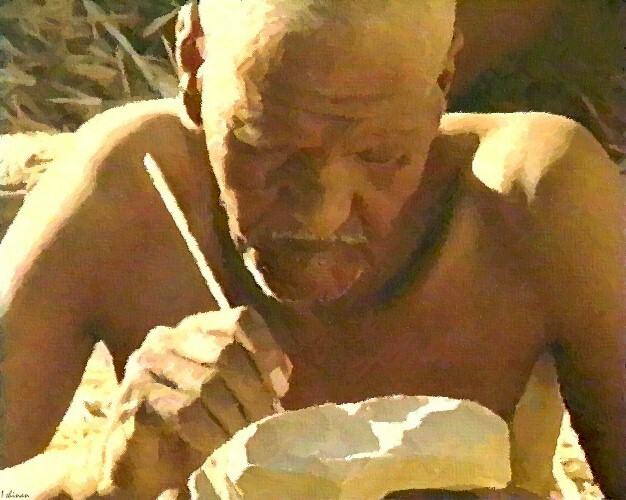 Arithmetical progression by fractions and elementary geometrical progression were fully comprehended and digested. Surface calculation was made on the properties of the triangle, the rectangle and the trapezium. The great Rhind papyrus (see papyrus below) in the British Museum contains many problems devoted to the properties of the rectangle, the triangle and the circle. 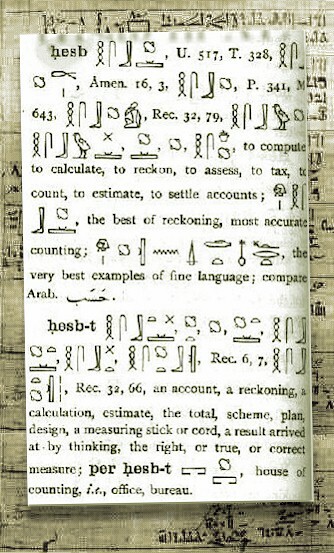 One can see an example of Egyptian mathematical theories "Hsb" recorded on it . The papyrus, a scroll about 6 meters long and 1/3 of a meter wide, was written around 1650 BC by Ahmas, the scribe, who had copied a document which was 200 years older. This makes the original papyrus date from about 1850 BC. The Egyptians applied their mathematical knowledge to practical affairs with extraordinary ingenuity. The papyrus Anastasi I, for example, contains a series of the building problems concerning the transport and erection of colossi, obelisks and enormous blocks of stone which the Egyptians solved with conspicuous success in practice. Rhind papyrus which was written around 1650 BC by Ahmas the scribe.